New Horizons is on its way to a new flyby, where it will study an ancient building block of small planets like Pluto, on New Year's Day 2019. As 2016 ends, I can't help but point out an interesting symmetry in where the mission has recently been and where we are going. Exactly two years ago we had just taken New Horizons out of cruise hibernation to begin preparations for the Pluto flyby. And exactly two years from now we will be on final approach to our next flyby, which will culminate with a very close approach to a small Kuiper Belt object (KBO) called 2014 MU69 – a billion miles farther out than Pluto – on Jan. 1, 2019. Just now, as 2016 ends, we are at the halfway point between those two milestones. During this phase between flyby of operations, all of the systems and scientific instruments aboard New Horizons are healthy. In October, we completed the 16-month-long transmission of all Pluto flyby data to Earth. Our science team is now steadily analyzing those data, making new discoveries and writing reports to research journals like Science, Nature, Icarus, the Journal of Geophysical Research and the Astronomical Journal. Almost 50 scientific papers reporting new results about Pluto and its system of moons were submitted this year! Additionally, our science and science operations teams have made two major Pluto submissions to NASA's archive of all planetary mission data, the Planetary Data System (PDS). Two final submissions to the PDS will be made in 2017, wrapping up the archiving of Pluto data for others in the scientific community to use. 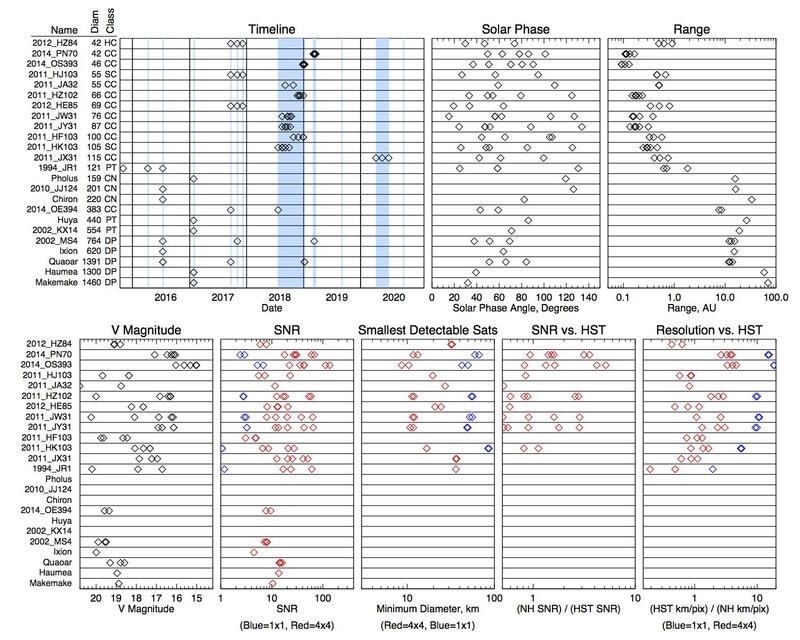 Those upcoming submissions will include better-calibrated datasets resulting from the intensive, post-Pluto flyby calibration campaign we conducted this summer using all seven payload instruments aboard New Horizons and a series of "meta-products" like maps and atmospheric profiles created from New Horizons data. 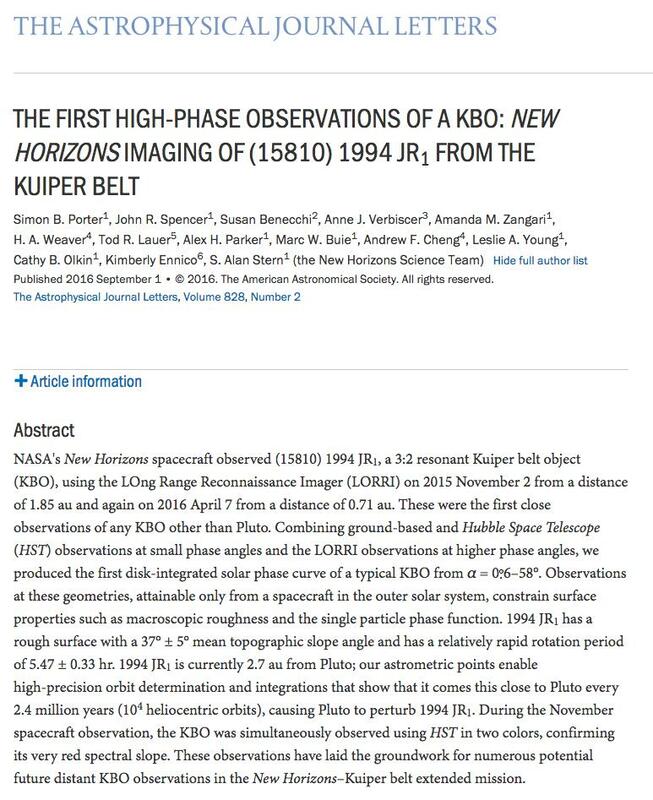 This is the abstract of the first scientific paper reporting new results from the study of KBOs by New Horizons, and the first observations of KBOs from within the Kuiper Belt. The full paper can be found on the website for The Astrophysical Journal Letters. The year ahead will begin with observations of a half-dozen KBOs by our LORRI telescope/imager in January. Those observations, like the ones we made in 2016 of another half-dozen KBOs, are designed to better understand the orbits, surface properties, shapes, satellite systems and frequency of rings around these objects. These observations can't be done from any groundbased telescope, the Hubble Space Telescope, or any other spacecraft – because all of those other resources are either too far away or viewing from the wrong angles to accomplish this science. So this work is something that only New Horizons can accomplish. Also in January, we'll continue studying the dust and charged-particle environment of the Kuiper Belt using the SWAP, PEPSSI and SDC instruments, and we'll use our Alice ultraviolet spectrometer to study the hydrogen gas that permeates the vast cocoon of space surrounding the sun called the heliosphere. February is likely to begin with a small (about a half-meter per second) course correction maneuver to better target the close flyby of 2014 MU69. In March, once all the KBO data collected in January is back on Earth, we'll put New Horizons in hibernation for the first time since 2014. That will last until September, when we'll begin several more months of KBO observations using LORRI. 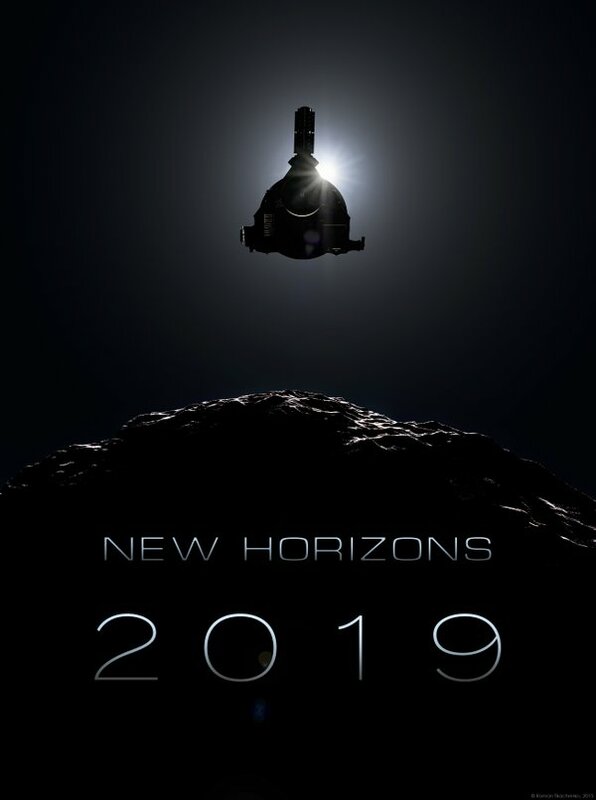 While New Horizons "sleeps" through much of 2017, our spacecraft, mission operations, and science teams will be designing, writing and testing the spacecraft command sequences for the 2014 MU69 flyby. For Pluto that job took most of 2009 to 2013. But because the MU69 flyby is barely two years away, we have to compress all the planning into the next 18 months. Why? Because flyby operations for 2014 MU69 will begin in July 2018! This diagram covers various aspects of our plan for observing almost two-dozen KBOs as we cross the Kuiper Belt between 2016 and 2020. When New Horizons reaches 2014 MU69 just under two years and two weeks from now, we'll be setting another record – for exploring the farthest world ever explored, over 4 billion miles from Earth! Since there no planned mission after New Horizons to explore worlds in the Kuiper Belt, it's anyone's bet how long it will be before our record is eclipsed. So, as 2016 ends and 2017 prepares to dawn, I want to wish you all the very best for the holidays and the coming year. I'm going to spend the holidays with family, thankful that our team has now successfully collected all of the data from the first exploration of Pluto and its moons, and is hard at work analyzing that gold mine! Thanks for following New Horizons on this website and on social media. I'll write again in early 2017, but until then, I hope you'll keep on exploring – just as we do! Can't get Pluto off your mind? 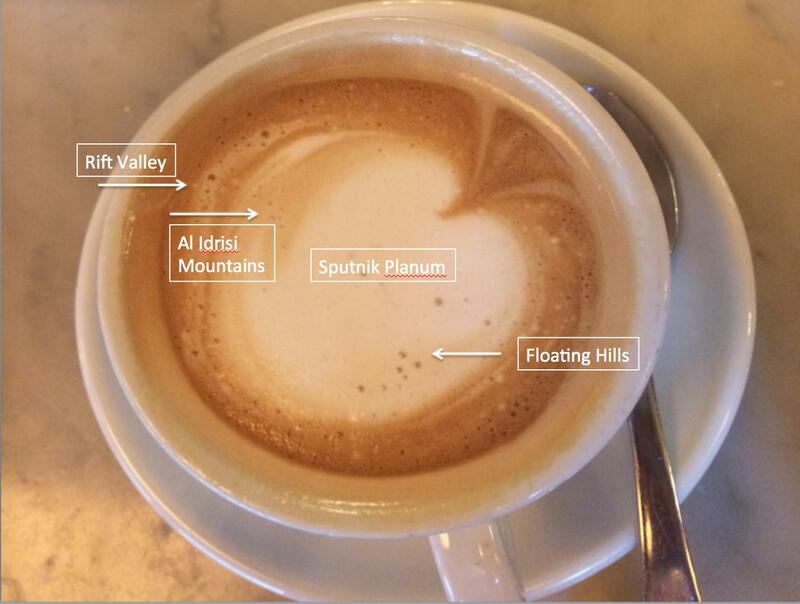 Me neither – sometimes even when I'm not working on data or research papers, such as when I was served this cup of cappuccino one morning. Share any quirky reminders of Pluto or its moons you have on Twitter @NewHorizons2015 or @AlanStern.